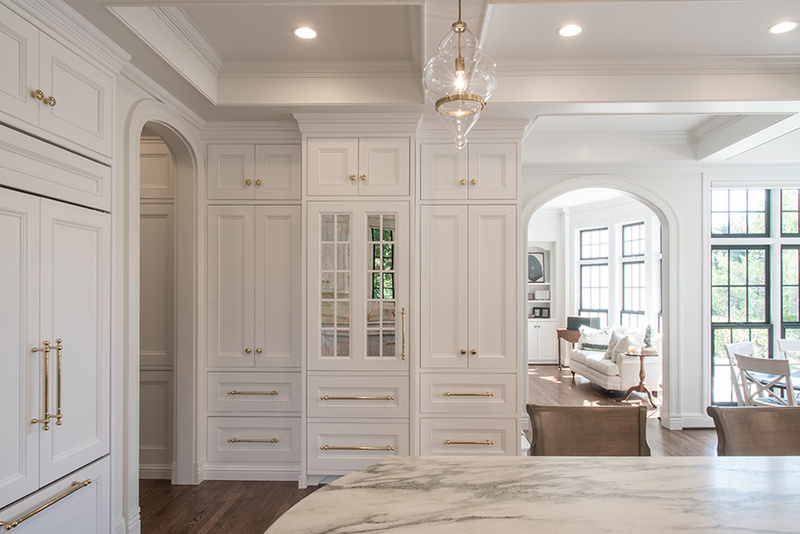 Open, beautiful and bright, the kitchen designed by Marc Christian Fine Cabinetry and Jamieson Interior Design was part of a complete first-floor remodel. New ceiling beams, elliptical arched doorways and millwork were installed to unify the space and add architectural interest. Window frames were painted black for contrast. 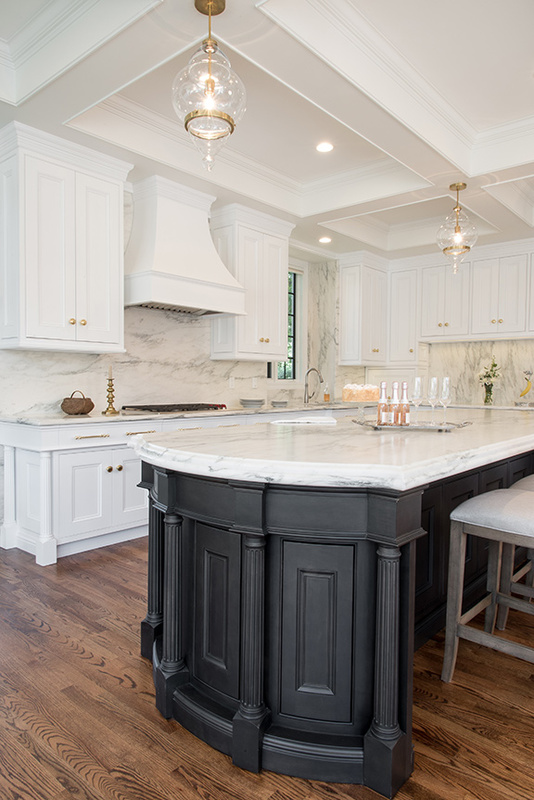 The custom perimeter cabinetry was finished to match the new millwork, and the contrasting ebony-stained island was built to hold Wolf ovens, a warming drawer and a microwave drawer. Using hybrid construction, the cabinetry features beaded inset doors below cantilevered full overlay drawers with applied molding continuing around the cabinetry. Fluted posts highlight the depth of the upper drawers and accent the cabinet areas and unique radius island ends with inset curved decorative doors. The island was given extra weight with a double thickness marble countertop, which matches the perimeter tops and backsplash. On one wall, a Sub-Zero French door flush built-in refrigerator with custom wood panels is positioned next to a Sub-Zero full-height integrated wine cooler with custom mullion-mirrored door panel. The result is a cohesive, functional kitchen that will be enjoyed for years to come. 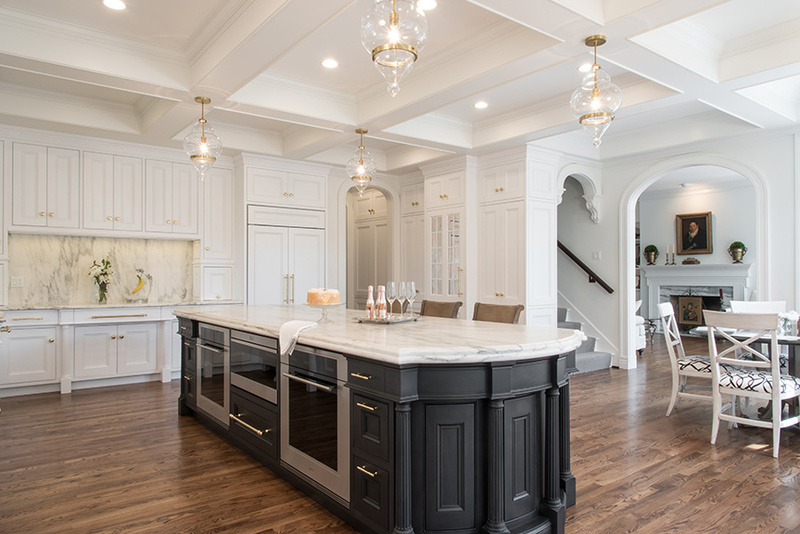 The custom millwork throughout the kitchen, especially the beams, arched doorways and island, are exquisite and make this space feel new yet classic. The double-thick countertop really makes the marble stand out.